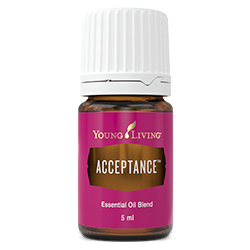 Containing Coriander and Geranium essential oils, Acceptance™ encourages feelings of self-worth and acceptance of others. This blend is great to have in your personal collection. Use this blend when going through a transition, trying to adapt to new changes, or taking on new ideas. Acceptance has a tranquil scent that inspires self-exploration, peace, and strength, and has a calming and balancing effect on the mind. Use Acceptance with Peace and Calming to face challenges with an open mind and a relaxed attitude. Combine with Lavender essential oil to tackle restlessness. Diffuse Acceptance to deter procrastination and break down barriers. Dilute and apply to wrists, edge of ears, neck or feet to instil a sense of openness and balance. Sweet almond (Prunus amygdalus dulcis) oil, Coriander (Coriandrum sativum) seed oil †, Geranium (Pelargonium graveolens) flower oil †, Furocoumarin-free bergamot (Citrus aurantium bergamia) peel oil †, Frankincense (Boswellia carterii) oil †, Royal Hawaiian™ sandalwood (Santalum paniculatum) wood oil †, Neroli (Bitter orange) (Citrus aurantium amara) flower oil †, Grapefruit (Citrus paradisi) peel oil †, Tangerine (Citrus reticulate) peel oil †, Spearmint (Mentha spicata) leaf extract †, Lemon (Citrus limon) peel oil †, Blue cypress (Callitris intratropica) wood oil †, Davana (Artemisia pallens) flower oil †, Kaffir lime (Citrus hystrix) leaf extract †, Ocotea (Ocotea quixos) leaf oil †, Jasmine (Jasminum officinale) oil**, Matricaria (Chamomilla recutita) flower oil †, Ylang ylang (Cananga odorata) flower oil †, Blue tansy (Tanacetum annuum) flower oil †, Rose (Rosa damascena) flower oil †.